One of my dreams is to buy two bananas and three oranges on the street where I live. Let me explain. The merchants of the Cairo streets are masters of merchandising. You can't walk down a street without finding a beautiful display of fruits or vegetables. Vendors spot a high-traffic area, make an attractive display, put up a price sign and they are in business. This picture actually shows two fruit stands about 50 yards apart. We usually shop at the one in the background. But new technology is not a critical factor for either the merchant or the customer. The merchant will always have one of these old balance arm scales to weigh your (or more likely, his) selection. And the the scale's product pan usually looks like it has been run over by a truck or stepped on by a horse. Yesterday, on our way to visit a section of old Islamic Cairo with guest, Sharon, and guide, Roshdy, we found ourselves on "Scale Street." Much to the consternation of everyone else, I fell behind the group, taking pictures. The street is only one block long but it is lined on both sides with shops selling scales. It was interesting to look over the the displays in front of the stores. Yes, there was the latest product from China, ISO 9001 certified, capable of price calculation with totals. But the majority of scales on display were the old balance arm models with a brass or cast iron base. These scales are at the heart of my banana and orange issue. Fruit is sold by weight and not by the "each." Can I buy two bananas? No. Two kilograms - yes. One kilogram or a half kilo? Yes again. Two bananas? That just doesn't compute! The smallest weight anyone has and can calculate for is a half kilo - a bit over a pound. You might find a quarter kilo somewhere but the math is hard. Now at 5 Egyptian Pounds for a kilo of fresh bananas (70 cents for 2.2 pounds) I shouldn't be concerned - but I still hope to be able to buy just two bananas one day. And here is one of the balance arm scales, ready for use, in a picture I took yesterday along al-Mu'izz Street. This vendor is selling seeds and nuts. A close look shows the scale weights and also reveals that birds have been sitting on the balance arm enjoying the lentils from time to time. Now for the metaphors and philosophy. When I started coming to Egypt ten years ago, the few Chinese tourists were described as tightwad tourists who didn't want to spend any money. Now they are the majority of tourists that still come to Cairo. They are described as only wanting to buy expensive things. They, of course, are manufacturing ISO 9001 certified scales for the whole world. The Egyptians are bound to the technology carved as pictures onto the walls of the pyramids. On the other hand, the Egyptian merchant's scale still works if it is kicked by a donkey, run over by a truck or mistreated by a pigeon. And it never needs a new battery. There is some metaphor in there for this country's problems. Perhaps it has to do with reluctance to change. Maybe it is associated with distrust of technology that the customer can't see. I will leave it for some young liberal arts or political science major to pull it out. I'm just an old math and technology guy who likes to take pictures and use computers. Here are close-ups of some of the scale weights. That's a 1 kg. on the left and two 1/2 kg. weights on the right. I finally did find two new electronic scales in use. One is in a fish restaurant in Alexandria and a second is, surprisingly, found along a street near the pyramids where this vendor packages food for the camels returning from their tourist rides. He keeps a stock of pre-weighed bags ready for the camel owners. Also, there are now a larger number of pictures in my Flickr Scale Street set. We took Linda's friend, Sharon, to see the sites in and around Khan el Khalili today. For me, that visit always starts with a shoeshine. The fellows doing this work do excellent work. Sorry I didn't remember to include the "before" shot this year. Souvenirs abound, the negotiations are fun and the salesmen are almost universally friendly. "Americans are the best," of course. Ask about visitors from a few other countries while you are here. It is an interesting way to learn how various people are viewed, especially over time. We had an excellent lunch that was heavy on meat before heading out for more shopping. At the end of the day we stopped for ice cream. We didn't really need anything to drink since tea had been part of the negotiations along the way, but ordered some "lemoon fresh," anyway. Of course, we drew both the young "trinket sellers" and a very friendly watch vendor with "genuine Rolex products from Italy." I made my annual watch purchase here for $14 after bringing him down from $55. This is cheaper than replacing the battery once a year. I know everyone at home worries about security for tourists in Egypt. Security seems quite a bit better here now versus our previous two visits. There is visible police presence, and they are well armed. That was a real problem during the revolution. I would show you pictures of an occasional army tank near major government installations too, except that my traveling companion discourages me from taking any such pictures. That police unit was standing watch near a mosque in a touristy area of Islamic Cairo today. A couple of weeks ago when we were out at IKEA on a Sunday, there was a police unit just about every half mile or so, along the Ring Road freeway. Controlling access to Tahrir Square was an issue during the revolution and Morsi overthrow. Streets were blocked off with huge concrete blocks which were hard to put in place. We noticed today that there are now 3 inch thick iron gates surrounding the square that can be closed quickly. Major shopping centers all have metal detectors and guards at the entrances. Some have bomb-sniffing dogs that check cars entering the parking lots as do most hotels. That bomb attack on the police that I blogged about some time ago involved two "thugs on motorcycles" and motorcycles have become a target of suspicion. Here was a roundup of motorcycles without proper licenses on Pyramids Street from a few days ago. The police and security staff here bear down on suspicious looking young middle-eastern men - not westerners and old ladies. It is an interesting concept. I am not challenged if I set off a metal detector at a shopping center. My Egyptian companion is. I don't think that will ever fly at home. So I don't think motorcyclists such as these - mom and dad with two kids on board and what is probably a father and son carpenter (note the circular saw on back) team on a scooter are going to suffer from increased scrutiny. By the way, importing motorcycles and Tuk-Tuks is now on hold for at least a year. We have a guest staying with us for the next ten days or so. Linda's friend, Sharon, arrived from the Twin Cities arrived last night after escaping from two feet of snow on the ground and the worst driving conditions that anyone can remember. That called for a celebratory breakfast and Linda obliged with a delicious omelet. Here she is preparing it in the new cast iron frying pan that our son, Terry, gave us for Christmas and that we brought with us in our luggage on this trip. Thank goodness Linda qualified for Delta's Skymiles program and a free second bag! We had planned to go out to dinner tonight but at about 5pm, the doobell rang and our neighbors sent over a large steaming bowl of Koshary and we stayed in and enjoyed that. But we thought we should top if off with a good dessert and discovered a new location for Fatir and Pizza, not far from the apartment. Star Pizza is located on Marrioteya street just about a mile from our apartment. They are a newly opened store and we were welcomed and invited for tea while the Fatir maker began spinning his dough. Fatir is a "dessert pizza" typically containing honey, nuts and cream inside of very thin crust. This is a family operation and one member of the family, Hussein, had lot of questions once he found out we were Americans. Hussein teaches English in the local high school with an emphasis on grammar and pronunciation and wanted answers to a lot of questions. "Cheese," he wanted to know, "why is it pronounced 'cheeze' and not 'cheece?'" We spent the next fifteen minutes pondering the imponderable pronunciations of the English language and confirming to Hussein that his pronunciations were almost always correct in spite of "rules" that would indicate otherwise. Students in his class are lucky, indeed. Meanwhile, the Fatir was spun, baked and packed. At a friend's house we looked over the results before diving in. Both the Pizza and Fatir got top ratings from us all. We visited the southeast Cairo suburb of Maadi this afternoon. We are often asked if there are any Americans that live near us here. The short answer is no. We have seen one in the neighborhood but that was several years ago. For the most part, Americans living here on either the Government or company dime tend to gather in Maadi, also known as Expat Central. This is a very attractive community along the east bank of the Nile and only about nine miles south of downtown. With tree-lined avenues, calm traffic and pothole-free streets it offers quite a contrast to most of the metro area. But the downside is that your neighbor is likely to be another American, a German or an Irishman. You don't really get to experience the Egyptian culture. Here are a few pictures of the Maadi area. But - we weren't here just to enjoy the scenery. Linda has read an ad on an ex-pat Facebook page titled "porkinegypt." And, when we arrived we found that just as advertised, today they were running a special on bacon. Don't you love the warning sign on the freezer? The price, by the way translates to a bit over $13 a pound. There are German pork sausages, ham and Eisbein for roughly the same price per pound. Not everything is cheaper here. King Faisal Street runs parallel to Pyramids and is shown in yellow on the map. Both of these streets are lined with small shops, department stores, coffee shops, restaurants and most of all, people! Some stretches of these two streets have a boulevard lined with palm trees, although the sidewalks are as uneven and unusable as most places in the city. Dary Department Store (visited in an earlier post) and numerous furniture emporiums can be found along Pyramids. There are some shops with names you will recognize and some you might not. Etisalat is a cellphone provider and the unlabeled shop to its right is a carpentry shop specializing in doors. These are three restaurants. Crunchy Chicken competes with KFC, Mermaid is a fish restaurant and Antar is one of our favorites for kabobs and other broiled meats. All three offer take-away on the first floor but Antar has the restaurant seating that you see visible above all three. It is fairly common for restaurants to have the seating on the second floor with the kitchen and take-away on the first. Here is a shoe store, sitting next to McDonald's. Notice the McDonald's motor scooter. Like all other restaurants, McDonald's delivers. Just dial 19991. How Do I Get Weather Underground to Show the Temperature in Fahrenheit? Now there is a popular question on the Internet! For most people, it's not a problem. If you are in the United States, the temperatures display in Fahrenheit and if you are in Egypt (or most anywhere else in the world) they are displayed in Celsius. - Except that I am in Egypt and want them displayed in Fahrenheit! 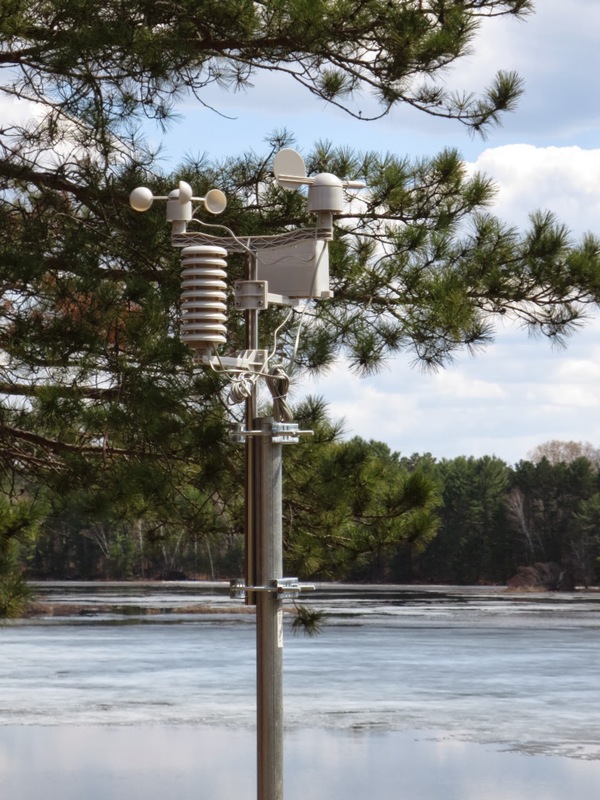 Weather Underground is the host site for thousands of amateur weather watchers around the world, as well as a source of professional reports and forecasts. I connected to Weather Underground, today to watch the latest storm come across Minnesota and all the temperatures were in Celsius. And I looked and looked for the "fix it" button or setting but couldn't find it. Just go there and look for the tiny F or C in the upper right corner and click it to change units for the whole website. That puts a cookie in your browser with the preference that the other page can use. With that done, I was able to follow the storm's progress. That was quite a drop in temperature from 30 to near zero as the snow passed by. Folks here apparently don't have as strong an interest in the weather as there is only one weather station up on the Wunder Weather network in Cairo - and not many anywhere else in Egypt. 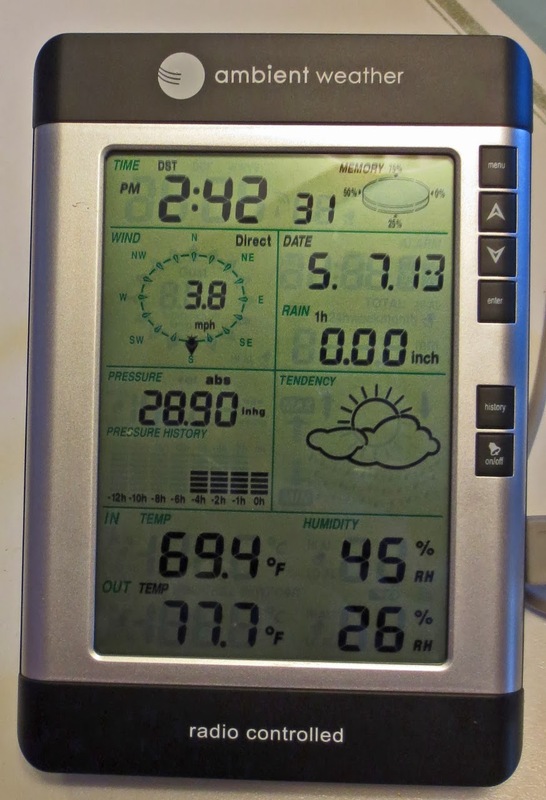 So, I am going to put a weather station on the list of things to bring next year since I am hoping to have a hard-wired Internet connection by then. I have a station for our cabin in Wisconsin that I put onto Wunder Weather network when we are there. We wouldn't need as elaborate of a unit here to keep you up to date on our weather. It has been called to my attention by a reader (yes there are readers of this blog!) that I haven't posted any food pictures for a while. I have been assembling a few pictures for a post of interesting spots along Faisal and Pyramids streets, but let's use a couple of them here. My favorite lunch here consists of a couple of felafel sandwiches from one of the many Gad fast-food restaurants. This particular Gad is located on Pyramids Road just before you would reach the Great Pyramids if you were taking that road from downtown. It's pretty easy to order. Just inside the door, there is a man with a cash register taking orders. Ask for four felafel sandwiches. Now here is the tricky part. In spite of what Wikipedia might tell you, "felafel sandwich" here is the name of a category of sandwich. Both "tameya" and "foul" are considered felafel sandwiches. You probably want tameya which is what an American thinks of as felafel - see this Food Network recipe, for instance. If you order four felafel sandwiches, you are going to be asked some variety of "two and two?" So, either order four tameya to start with or be prepared to deal with the two and two question. What you will end up with is a ticket that you will need to take to the counter way at the left end of the store shown in the picture. You will get your sandwiches plus a container of pickles in a bag. The price for four? Seven pounds. Exactly one U.S. Dollar. They look like this and are delicious. We never did find the guest room lamp we were looking for at IKEA on Sunday. So yesterday, we headed over to Pyramids Street and visited the Dary department store. Dary is a six level building loaded with goods for the kitchen, bath, patio and other home areas. They have a fine selection of hammers, wrenches, chain saws, leaf blowers and the like too. The first floor has the kind of things every bride would want to put on her bridal registry. Take this tissue box, for example. Moving upstairs, there is quite a selection of crown moldings and flooring on display. Folks here are inclined toward a lot more gold in their furniture than we are accustomed to. Speaking of "upstairs," the circular stairway has had a fresh coat of paint since our last visit. Linda found a suitable lamp, I bought a small leafblower for the dust on the balcony and we picked up a couple of items for the kitchen. It was a very productive day. The power went off for the eighth(?) time last night. Unfortunately, Linda was across the hall at the neighbor's and hadn't taken her flashlight. I fumbled around and found one of our two for when she would be returning. After about twenty minutes, I heard her at the door and shined the light her way as the door opened. She about blinded me with the light she had brought home with her. It's a two-tube fluorescent fixture that stores use for emergency lighting. We lit the apartment for dinner with it. Our neighbors keep two of them. After the power came back on, I took it back to our neighbor and asked where I could buy one. He said that he'd pick one up for me downtown in the next day or two. It will be a welcome addition. Based on our experience, these winter power outages are unusual and may lead to more serious issues as summer arrives as noted in this article. Last night, just before 11 p.m., the doorbell rang. It was the 4-year-old and 9-year-old from across the hall. They had a new emergency light for me. Dad had just returned from downtown and sent them over with the light. And it was fortunate that he picked it up so quickly. Tonight at 7 p.m. the lights went out for an hour as we were preparing dinner. With matches to light the gas stove and our new emergency light on, we hardly missed a beat. The "lights out" program appears to be part of a planned conservation program necessitated by a shortage of natural gas. At least that was the message in most places. But, I see there is now at least one report that "The Brotherhood Did It." 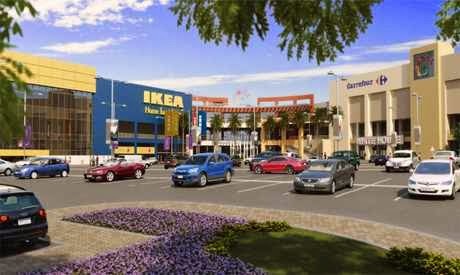 Twice each year, as we commute to and from the airport, we pass the IKEA store at the Festival City Mall on the Ring Road. The mall has been complete for some time but didn't open until this past November, what with revolutions and other issues. This issue of Al Ahram said there had been a three-year delay in opening. We took it as a positive sign for the economy and security when they opened. I saw this picture (and several others) on the Ahram website and was looking forward to lots of green trees, flowers and even a row of lilacs that I could see in one of the mall website photos. A friend had offered to take us anywhere we would like to go so we suggested an outing here. We left early in the morning since store traffic would likely be heavy later on Sunday afternoon. I don't know what happened to the green grass, pretty flowers and tree foliage. Perhaps they were only computer generated? Once we entered IKEA, it was like being transported into another country. As a matter of fact, even before we entered. The handicapped parking sign and total lack of plastic bags, paper and other trash in the parking lot suggested a much different lifestyle on the east side of the metro area. It was less than twenty miles along the Ring but it might have been several centuries in time. Inside, IKEA has all the expected amenities and all the merchandise is tagged in two languages, Arabic and English. Of course, you expect a selection of middle-eastern carpets in a store here, but I was surprised by the large selection of cowhides. Of course, the big question, "Do they have Swedish meatballs and mashed potatoes?" "You betcha!" Ten meatballs for 27 Egyptian Pounds - a bit less than $4. The final result didn't look quite as good as the picture - but maybe that's because I forgot to look for the Lingenberries. And something tells me that the meatballs didn't have all of the ingredients in a classic recipe like this one. We found a good desk chair and a nice desk lamp plus a number of kitchen items. We wish this store had been here when we first started furnishing our apartment, we would have had a much easier time. The several hours we spent in IKEA meant that we didn't get to the rest of Festival City so we will have to make a return trip to visit Marks and Spencer and the rest of the retailers here. But we passed a couple of other buildings on the way out that we don't find in out neighborhood so here are two more pictures. Cairo has long been known as the "Hollywood of the Middle East" or "Movie Capital of the Arab World." Today, as we headed out to the animal hospital, we noticed a particularly "tricked out" tuk-tuk. We didn't think anything of it as there is a perpetual contest here to produce the fanciest of these machines - not to mention achieving incredible sound levels with their audio systems. But, on the return trip, we rounded a corner and found we were right in the middle of a video or movie making production. The crews from Flicker Media Production Services and a few other companies were hard at work filming a scene with that tuk-tuk. Here, the director gives final instruction to the actors who will be running behind the vehicle. Then, it's "Action!" Then a review and, most likely, another take. But we were on our way by then. We awoke this morning to discover that it had also arrived in Cairo. Rain was falling outside and temperatures were still in the 50's as noon approached. We were headed back to the veterinarian again, south of town, to pick up Dusty, our building's favorite cat. (Dusty won't be having any more kittens.) The rain meant that the roads were relatively deserted since wipers and windshield defoggers are not kept in tip-top shape for the rainy day that comes only once every year or two. Most drivers simply stay home when rain comes. But the worst inconvenience caused by rain here is the mud. All that dust gets washed off the palm trees and flowers - maybe even off part of the buildings. But the roads turn to dirty, sandy mud. Cookies are not a common item in Egypt, especially home-baked cookies. After I began giving my neighbor my home-baked cookies on a regular basis last year Laila, the 15 year old daughter asked me to teach her how to make cookies. Since their first taste of my baking was chocolate chip cookies that's what she meant when she said "cookies". We had a baking session and that was pretty much it for the 3 months we were in Cairo. Now it's 2014, we're back in Cairo and Laila (now 16) asked for more baking instruction. We set a date to make cappuccino cupcakes and it was pretty much a disaster during the 4 tortuous hours it took to make 8 cupcakes. That was my take on the baking lesson. She, however, gained so much confidence from that experience that she began baking on her own. 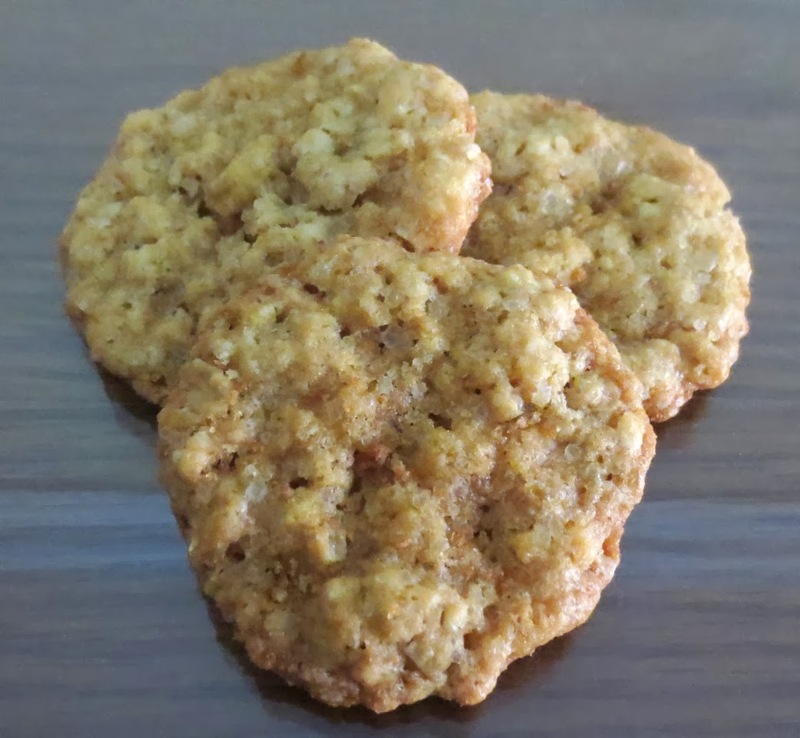 One day Laila sent her younger sister to our apartment with a bag of oatmeal cookies and a note. I was very surprised that she had baked these cookies totally on her own. I wasn't even in the building. The cookies were perfect and they tasted good too. I immediately went over to congratulate her. Now Laila had so much confidence that she wanted to make an apple pie. I'd made one last year and she loved it. I explained that a pie is advanced baking and that apple crisp is a good alternative. When she asked for a recipe for apple crisp I said, "I don't have one but if you ever want a recipe you can look on the internet and find thousands of recipes." She pulled out her tablet and searched. Sure enough there were thousands of recipes just for apple crisp. She asked, "How do I know which one to use?" We looked at a few and chose one. She said she'd make it. I didn't think any more about apple crisp until Laila phoned a couple days later asking me what to do with the apple crisp she had just made. Should she put it in the fridge or leave it out? OK, now I was in shock. I grabbed my camera and headed right over to see this apple crisp. It looked good so we tasted it. Perfection! I was so proud of my baking student. She spooned some into a couple bowls for me to take home. Later that night, after dinner, we ate her apple crisp. Oh my gosh, it tasted so good. 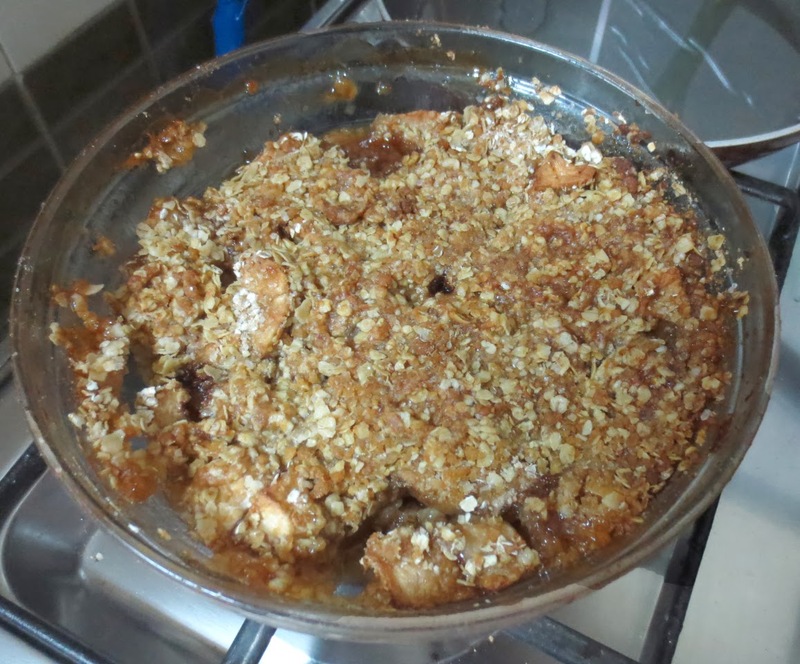 Laila's apple crisp was so inspiring that I had to make some of my own a couple days later. I have to admit that hers was much better. I guess a new baker takes more care than an experienced one. Note: While I'd love to include a photo of my protege, she wears the hijab so photos are forbidden. I was headed out to the neighborhood grocery store on Sunday evening when I noticed a car on the edge of the road with a wheel and brake-drum pulled off and lying beside it as two people were working on a problem. It reminded me of another difference between home and Egypt. There are very few tow-trucks in this country. I suppose that I have seen some but don't recall any now. Here, things are basically, fix-in-place. I have been in a car that was towed here a couple of times. One occasion was when the driveshaft fell off a friend's car. (I've seen that happen to other cars here, too.) No tow-truck was involved. Our friend got his rope out of the trunk and waited until a passing car offered a tow. Yesterday, we were walking up to the bakery when I noticed this truck parked by a lumber yard. Obviously, the driver was having a fuel tank problem and he or a nearby mechanic had removed the tank to take it for repairs. The extent to which sidewalk mechanics take on jobs is shown in this picture from last year. But mostly it is the small stuff. There are four places to get air in your tire or have it repaired/replaced in the half-mile of road in front of our building. This is the latest one to open. I suspect that it has quite low overhead since it seems to be situated on the shoulder and median next to a freeway support pillar. A couple of friends have told me, "It's illegal, but since the revolution ..."
I think the picture tells the whole story. Note the right front tire. It did come up off the road on the turn. Linda suggested that I need to shoot more video. It was Friday again today, so there was another bombing downtown. Most of the reports followed somebody else's lead and reported the location as "Giza, Cairo's Twin City." Abc News: "a bridge in Cairo's twin city of Giza Friday morning,..."
Associated Press via C(anadian)TV: "a bridge in Cairo's twin city of Giza Friday morning..."
The English Guardian "goes long" with: "in Giza, on the outskirts of Cairo...:"
UPI shies away from the outskirts, with: "detonated on a bridge in central Cairo..."
Technically, it is Cairo on the east side of the Nile and Giza on the west but the metro area is referred to as Cairo most of the time. These two bombs were apparently small devices resulting from efforts described as "two men driving a motorcycle threw the two bombs and fled." That, according to a report by DANA EL HADIDI of the Cairo Post. A good description of the site would be "on the overpass at Giza Square about two miles southwest of downtown Cairo and close to Cairo University." The Muslim Brotherhood-led coalition that supports ousted president Mohammed Morsi, who was removed from power in July's coup, issued a call earlier this week to "continue the revolution." Pro-Morsi protesters have staged near-daily demonstrations since his ouster with the largest rallies usually on Friday or key anniversaries, though their numbers have dwindled in the recent months amid a security crackdown. You would have to go a long, long way from where we live to encounter a pro-Morsi rally! Here's a hint. Don't suggest to most Egyptians that the Brotherhood has something good to offer. Which brings us to this Al Jazeera report that President Obama is, in fact, a member of the Muslim Brotherhood. Which is probably reinforced by this meeting at the White House between Obama and an English leader of the Brotherhood. I'm not sure that the White House has quite caught the drift in public opinion here. Egypt said 20 Al-Jazeera journalists, including both Egyptians and foreigners, will face trial on terrorism-related charges. How did the United States like that news? Not very well. And so how did Egypt feel about the resulting U.S. criticism of Egypt? Egypt's foreign ministry on Thursday dismissed US criticism of the charges placed against Al-Jazeera journalists for belonging to a terrorist group, arguing that Egypt's judiciary is fair and independent. Well. That should give you a feel for the politics here. Now I also promised you some religion, since it is Friday. Here goes. This BBC story reports on the new effort by the government here to control the themes of the preachers in Egyptian mosques. The Ministry of Religious Endowments is the official Egyptian body which will decide what imams or preachers should tell the millions who attend the weekly prayers, known in Arabic as salat al-jummah. Attendance is obligatory within Islam for Muslims without a valid excuse such as sickness. Now an American reading that is doubtless aghast at the thought of a government bureaucrat setting the sermon theme for his or her pastor at church on Sunday. So I checked with a couple of friends. Yes, last Friday was the first one following this practice and it was reported to be about 90% effective. Is this a good idea? Oh yes, said one of the friends. He mentioned that some of the Imams were going far astray on their own and teaching such things as not saying "Salaam-Alaikum" to foreigners or non-believers. In contradiction of The Holy Koran, he added. Keep in mind that the government and religion are closely intertwined here. Al-Azhar University, the seat of religious authority is a a state institution. Well, that's enough politics and religion for one setting. I'll get back to pictures and everyday life again in the next post. But remember that if your biggest political problem is just that Republicans and Democrats don't play well together, you should count your blessings. The Working Group on Egypt assumes that the Egyptian government is harsh and repressive. But does it realize that most Egyptians have often accused the interim government and its predecessors of being too soft and indecisive when standing up to those trying to drag their country to chaos and anarchy? About ten days ago, we encountered this propane cart on our daily walk. (Propane, for cooking, is another of the heavily subsidized energy products in Egypt.) We have seen this horse cart a number of times before. Usually it is piloted by the young boy alone in the front seat with his mother and two younger children riding in the back. Today, the young driver took his cart past us and then got stuck in one of the newly formed ditches that appear from time to time across the road. This one was about a foot deep and two feet wide and he was stuck good. Linda and I caught up, put our hands to the wheel, so to speak, and helped push. We were soon joined by one other man and had the cart out and on their way. Lesson learned - it is much easier to rock a car in Minnesota snow than rock a horse cart in the sand. Later, before we got back to the apartment, we found an older gentleman (perhaps even as old as I) pushing his car toward the gas station at the end of the block. He was pretty tired and resting for a bit. "No Benzeeen!" he explained, as I offered to help. We pushed him a couple of hundred yards down the road to the local station. Fortunately, most Egyptian autos are easy to push - it is frequently necessary. The driver was very appreciative. Right next door to the new green grocer described below are a series of shops. The Golden Eagle papyrus shop, a crystal shop and a perfume shop. These are the traditional souvenir shops of Cairo. If you are on a tour, your bus will stop at a perfume shop and you will learn the history of perfume. You will have tea, of course. Then the salesman will explain how perfumes originated in ancient Egypt and how the great French perfume factories actually buy the essence of fragrance from Egypt and then add extraordinary markups. Luckily, you can purchase those same fragrances here at a great discount! Unfortunately, a few months ago, one tourist who heard that spiel left the glowing ember of his cigarette in a wastebasket. The store burned. Now there is something to be frightened of in Egypt. We are on the eighth floor, there is a tire repair shop on the ground floor and our bawab frequently has an open fire nearby to stay warm on those 56 degree nights. Fortunately, these apartment buildings are constructed of brick and concrete with very little wood or other flammable material inside. You never really hear of an apartment fire that engulfs a significant part of a building. The perfume store fire was confined to the store - but totaled the shop and contents. We have been watching the remodeling since we arrived in early January. We were invited to come in on Sunday and see the new shop. We met the owner, Mohamed, and spent some time (with tea, of course) in this, one of several sales and demonstration rooms. It is not unusual for these stores to be called a museum or factory, as in, "then we will stop at a factory where you can learn about perfume manufacturing..."
Here you can see a closer view of some of the perfume bottles. These are probably some of the better souvenirs of Egypt, being unique to the country. If you have been on a tour of Egypt and stopped at a papyrus or perfume shop between the Great Pyramids at Giza and the step pyramid at Saqarra, chances are pretty good that you stopped here. Last Friday when we were returning from our daily walk, we were surprised to see a new business open down the block. We now have a "green grocer" just a few minutes away. Of course, we stopped in and picked out a few vegetables. This is quite an advance for us since we get to choose the specific tomatoes or cucumbers, etc. The street vendors will do the picking at most of their stands. The owners were happy to pose with their wares. While we were downtown on Saturday, I took a few more pictures. This elegant old building from the British era stands across from the Egyptian Supreme Court and I hadn't noticed it before. This picture was intended to show the large photograph of General el-Sisi. We haven't seen a great many of these. It also contains a good picture of a traffic cop with his ticket book and cigarette in one hand and pen in the other. We stopped in at this bakery to buy a couple of breakfast croissants and some sweets. And we paused at a subway entrance where our friend picked out some fruit on this busy corner. While he was doing that, I used the opportunity to take a picture of this small park and the tomb of Saad Zaghloul that somehow we have never photographed before. The reason this blog crashes your Safari web browser on your iPad is now documented on Tom's Rants. Only techies will be interested. My choices appear to be, reduce the number of pictures or not worry about the iPad users. Sorry, Apple fans. I'm told the blog loads fine on Android devices. You may want to try one. We got a ride downtown today with a friend to do some appliance shopping. Last year, I mentioned our bad experience with a blender. We decided to get a quality unit this year. After checking costs and selection at Carrefour previously, we decided to try looking in the appliance district. Retail space in Cairo is arranged by category with lamp vendors all gathering on one street, nut vendors on another etc. Our friend took us through the bicycle district (sorry I didn't get pictures of that) and into the several blocks of appliances. It is a bit overwhelming to look down the block and see this scene. This man is moving a refrigerator. They are quite a bit smaller and lighter here than at home. We tried several shops to get an idea of blender prices and features. At this shop, the boxes were stacked to at least twelve feet high. Don't expect anyone in the store to ever go a stockroom in Egypt. All the inventory is in plain sight. But don't worry if the shop doesn't have everything you want. The owner will send a runner to a nearby store to get anything else you might like. We found a rugged looking 1000watt French model and made our purchase. While Linda was making her final selection, I wandered outside a bit to take more pictures. This is another opportunity to see why "everything is different here." Almost every shop had a large stack of these appliance frames standing out in front of the shop. They are an adjustable 4-wheel frame that you place under your stove, refrigerator or washing machine. That way, you can easily clean underneath when you mop/squeegee your tile floor. We have one under the stove and without it, the stove would be about five inches below the adjacent cabinets. You might also notice in that picture of the appliance frames that there is a plastic chair and a hubbly-bubbly shisha water pipe. A good place for the owner to relax when there aren't any customers. What's the Price of Gasoline in Cairo This Year? And why does it matter? We'll get to that shortly. The pump price is 1.85 Egyptian Pounds per Liter and there is no shortage. At today's exchange rate of 6.96 pounds to the dollar and 3.79 liters to the gallon we get $1.01 per gallon! This is down slightly from last year, mostly due to the declining value of the Egyptian Pound. Why does it matter? I have talked to multiple friends who complain about the corruption in government and the billions of dollars that go into the pockets of the government officials or the military. As it turns out, the Egyptian government spends fully 20% of its budget (perhaps $7 billion, perhaps $17 billion per year) subsidizing the cost of energy. People will talk of amounts less than a billion or even up to several billion going to political factions but I have yet to hear anyone criticizing the many billions that go into their gas tanks.